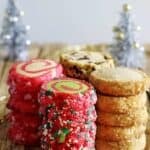 1 Basic Dough – 4 Slice and Bake Christmas Cookie Recipes! 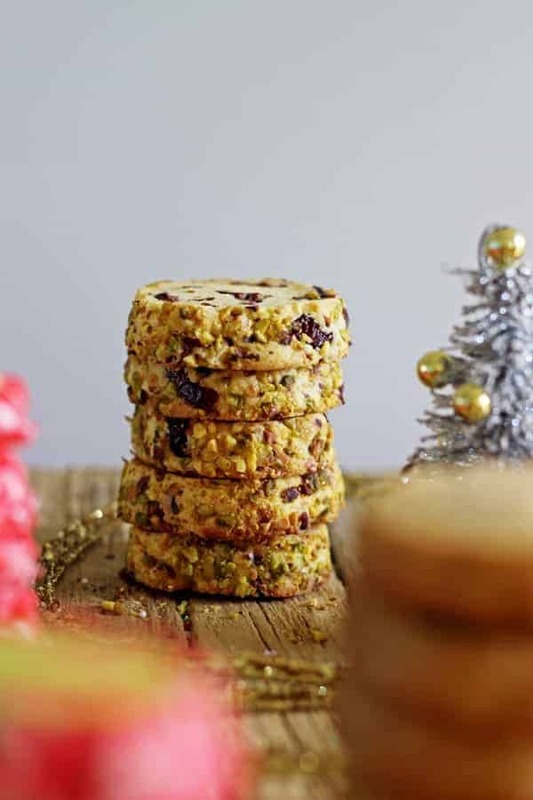 This one super simple cookie dough becomes four easy and festive slice and bake Christmas cookie recipes! Great for Christmas parties, teacher gifts or a cookie exchange or something to leave out for Santa! I have the cookie recipe to end all Christmas cookie recipe dilemmas today – 1 basic dough, 4 slice and bake Christmas cookie recipes! If you were starting to wonder how you were ever going to decide where to start with your Christmas cookie baking (just me?) look no further. These 4 slice and bake Christmas cookie recipes will see you through to the big day and beyond! The basic slice and bake cookie recipe comes from my sprinkles slice and bake cookies which were adapted from my Mum’s recipe that she used way back when we were kids! Except that today it has a Christmas flair, because obviously we are all living, breathing and eating Christmas at this time of year…please tell me that’s not just me! 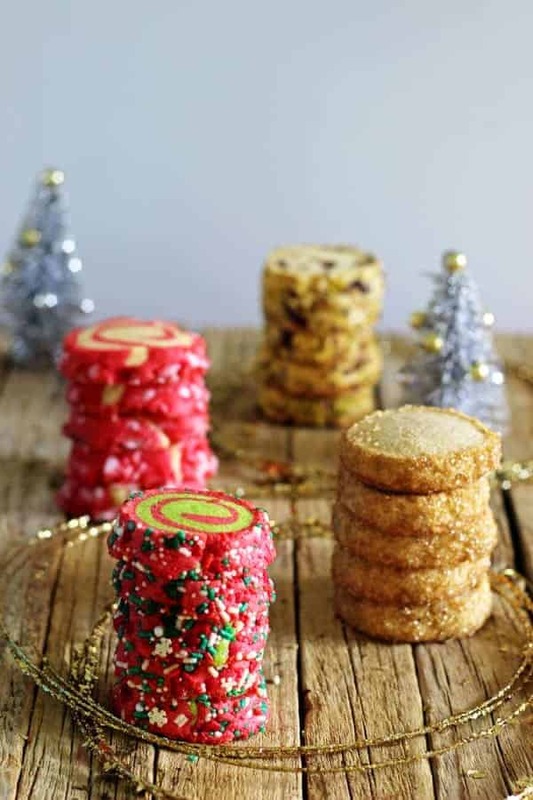 These are just plain old (but still delicious) vanilla cookies but they’re red, green and rolled in Christmas sprinkles! 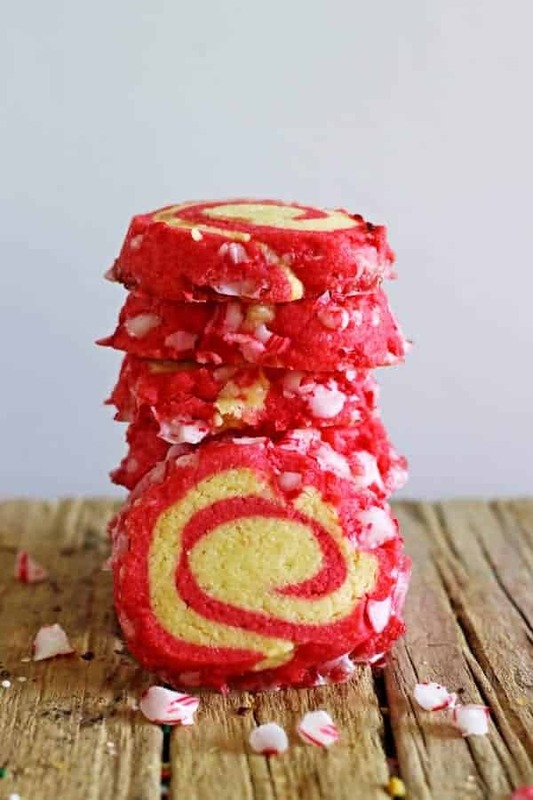 You split the dough in two, colour one red and one green and then roll them out separately, lie them on top of each other and roll together before slicing. They just look like Christmas don’t they? 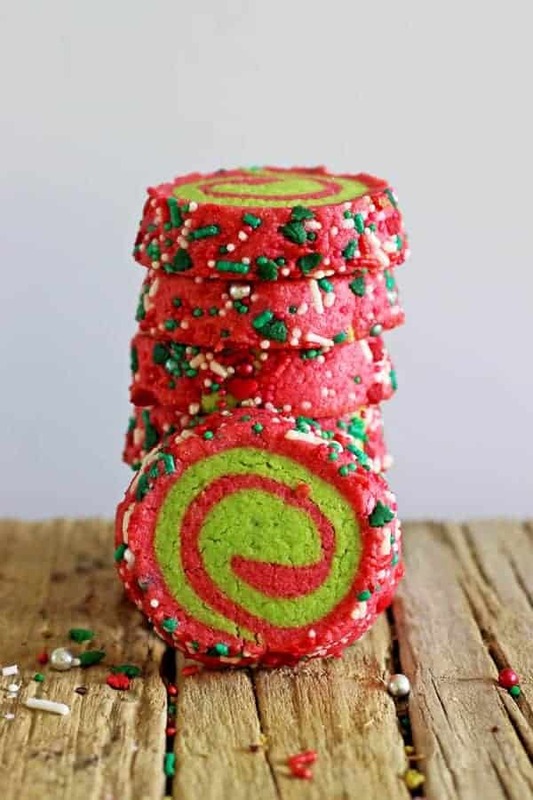 These ones have a little peppermint extract in the dough and are rolled in crushed candy canes. They are made the same way as the Christmas Pinwheels but only colouring one batch of the dough red. The candy canes will melt a bit during baking but I still love having them on there! 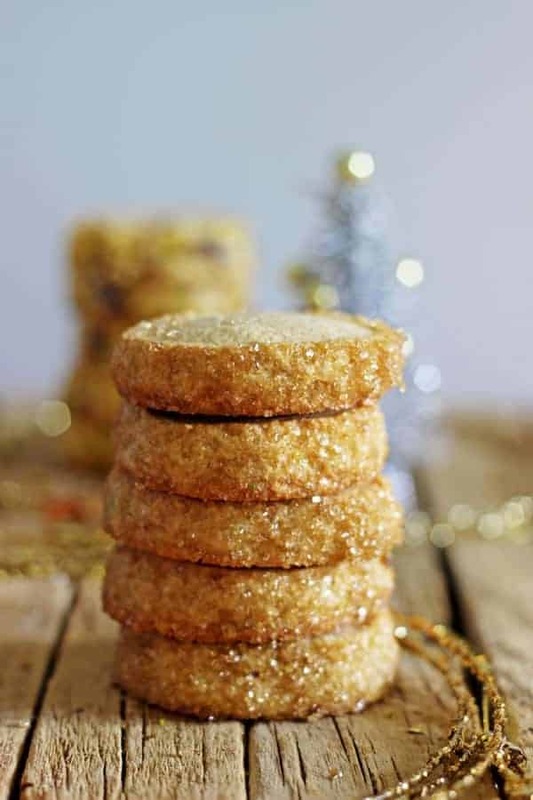 Flavoured with cinnamon, nutmeg, ginger & allspice makes them super tasty and then they are rolled in raw sugar which gives them a nice crunch…and makes them sparkle! 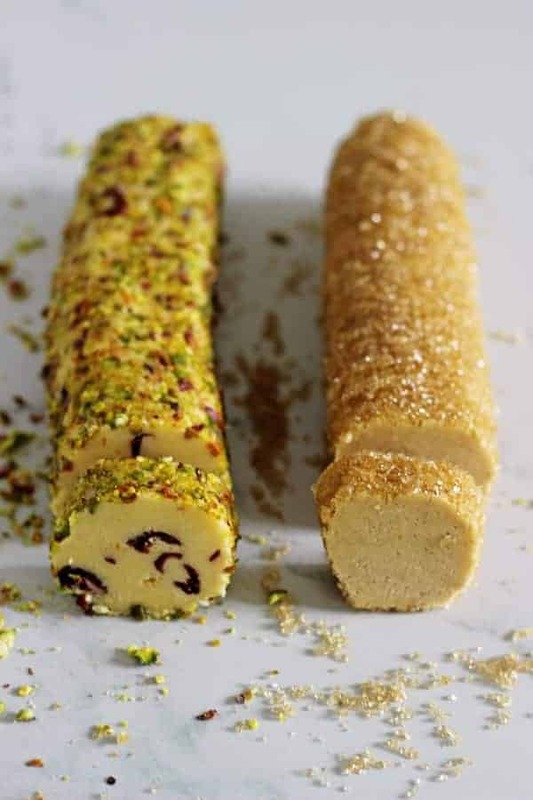 Orange juice, orange zest & dried cranberries flavour the cookies and then they are rolled in crushed pistachios. 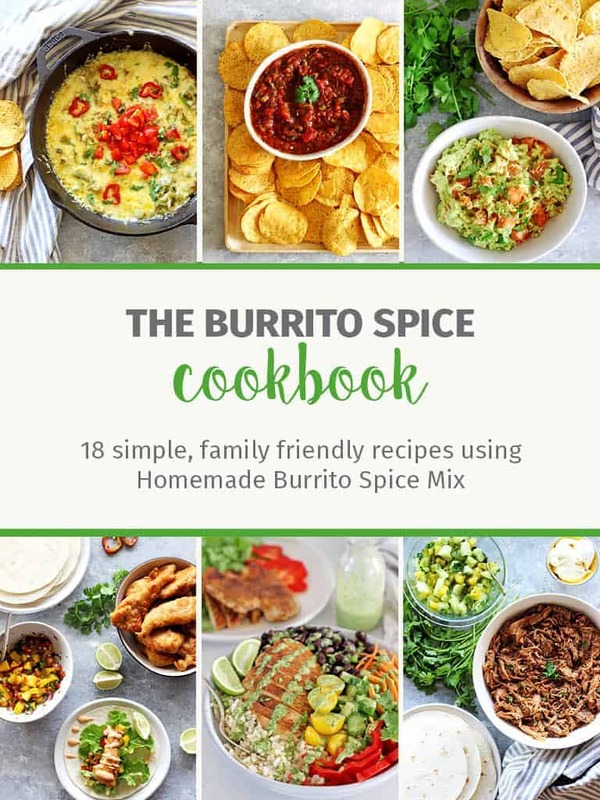 Have you picked a favourite yet? I can’t! Everytime I eat one I think that’s my favourite until I have a different one! But if you really twisted my arm I would have to say there is something super Christmassy about the Christmas Spice ones. 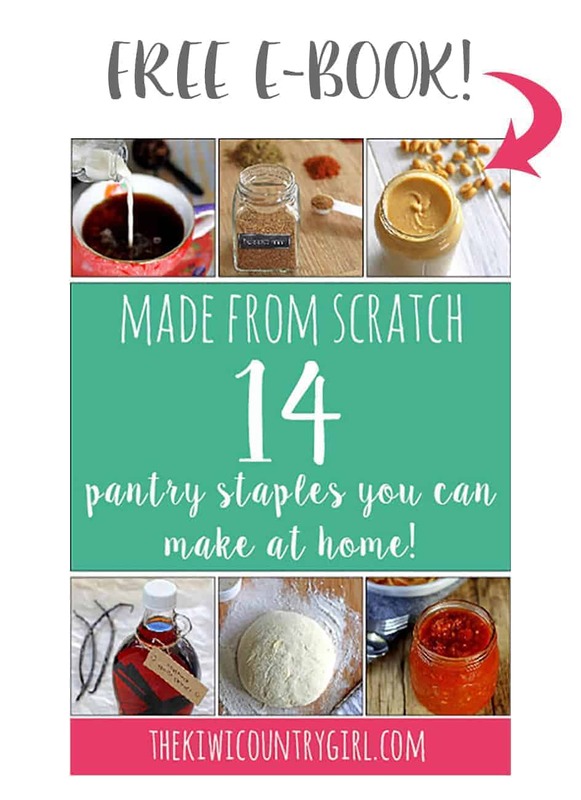 The best thing about these recipes is that you can make a big batch of the sugar cookie dough, split it up and then make each one as you feel like it. Or all at the same time…don’t you think this looks like the perfect plate of cookies to leave out for Santa on Christmas Eve? This is how the recipe below works. Make 1 quantity of sugar cookie dough and pick 1 flavour and add the extra ingredients. Simple – the amounts listed for each flavour of cookie is enough for 1 batch of dough. If you want to make more flavours and want lots of cookies, either double or quadruple the sugar cookie recipe and then split it and make the flavours separately. If you want less cookies but still lots of flavours, make the sugar cookie dough, split the plain dough in half and then half the add ins for each flavour. Make sense? No go and make Christmas cookies! Christmas music is compulsory! 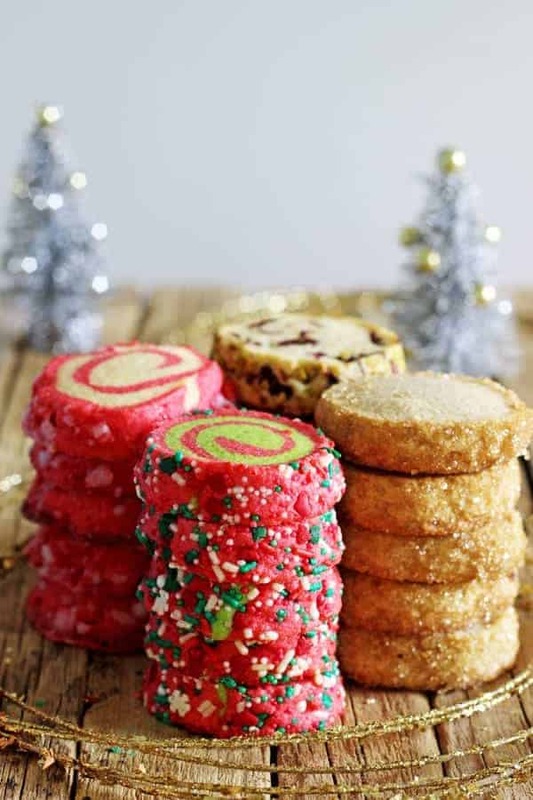 1 Basic Dough - 4 Slice and Bake Christmas Cookie Recipes! Cream butter & sugar in the bowl of a stand mixer on high speed until light & fluffy. Add the egg and vanilla and beat until well combined. Add flour, baking powder & salt and mix in well. Split the dough in half and add 1/4 tsp red food colouring to one half and 1/4 tsp green food colouring to the other half. Mix it in really well (it's easiest either using the stand mixer or your hands) so that the dough is completely coloured. Add more colouring if you want it brighter. On a piece of baking paper, roll out each piece of the dough into a rectangle 40cm x 30cm. Leave the dough on the baking paper and place in the fridge to chill for 20 minutes. Remove from the fridge and carefully flip the red dough on top of the green dough and gently press together. Peel the baking paper off the dough and with the long side of the dough rectangle facing you, carefully roll it up into a tight log. 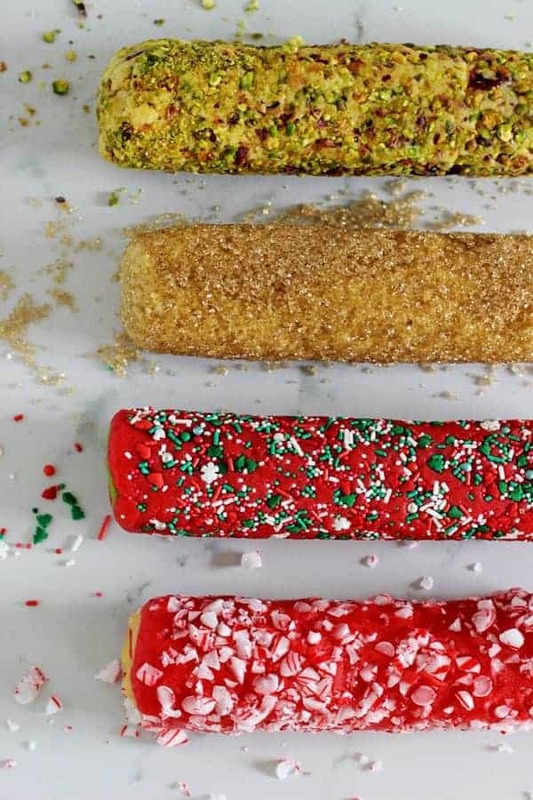 Add the Christmas sprinkles to a shallow baking dish or tray and roll the cookie dough log in the sprinkles until it is completely covered. Wrap the cookie log in gladwrap and place in the fridge for at least 2 hours. Follow the baking instructions below for all cookies. Split the dough in half and add 1/4 tsp peppermint extract to one half and 1/4 tsp red food colouring to the other half. Mix it in really well (it's easiest either using the stand mixer or your hands) so that the dough is completely coloured. Add more colouring if you want it brighter. On a piece of baking paper, roll out each piece of the dough into a rectangle 40cm x 30cm. Leave the dough on the baking paper and place in the fridge to chill for 20 minutes. Remove from the fridge and carefully flip the red dough on top of the white dough and gently press together. Peel the baking paper off the dough and with the long side of the dough rectangle facing you, carefully roll it up into a tight log. 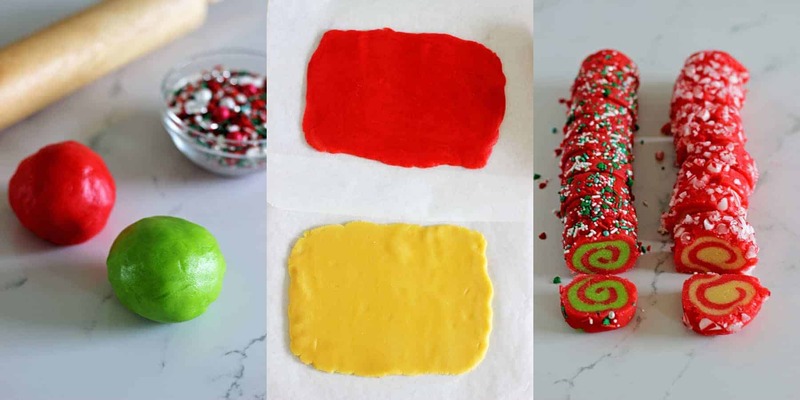 Add the crushed candy canes to a shallow baking dish or tray and roll the cookie dough log in the candy canes until it is completely covered. Wrap the cookie log in gladwrap and place in the fridge for at least 2 hours - it is really important that these ones are chilled well as the candy canes do melt when baking so the longer it has chilled, the less they melt! Add the raw sugar to a shallow baking dish or tray and roll the cookie dough log in the sugar until it is completely covered. Wrap the cookie log in gladwrap and place in the fridge for at least 2 hours. Add the crushed pistachios to a shallow baking dish or tray and roll the cookie dough log in the nuts until it is completely covered. Wrap the cookie log in gladwrap and place in the fridge for at least 2 hours. Remove the cookies from the fridge and slice into 1-2cm thick slices. Lay the cookies out on a baking tray lined with baking paper or a silpat liner, leaving a couple of centimeters between cookies and bake for 12-14 minutes, or until starting to go golden. Allow to cool on the tray for 5 minutes, then transfer to a cooling rack. Store in an airtight container for 1 week. The amounts of extra ingredients listed for each flavour of cookie is enough for 1 batch of sugar cookie dough. If you want to make more flavours and want lots of cookies, either double or quadruple the basic sugar cookie recipe and then split it and make the flavours separately. If you want less cookies but still lots of flavours, make the sugar cookie dough, split the plain dough in half and then half the add ins for each flavour.